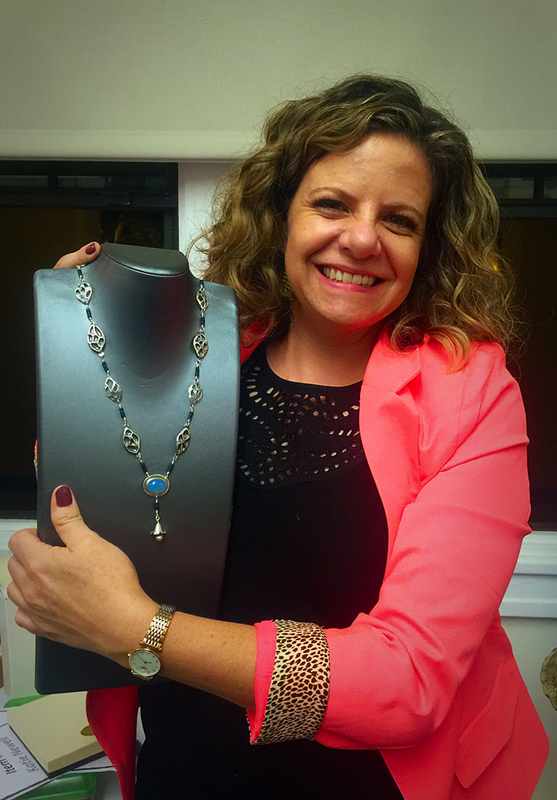 I was recently asked to participate in a Women’s Jewerly Association fundraiser called “The Maker Project”. This project was conceived by Lisa Slovis Mandel who is in charge of scholarhsips for WJA. 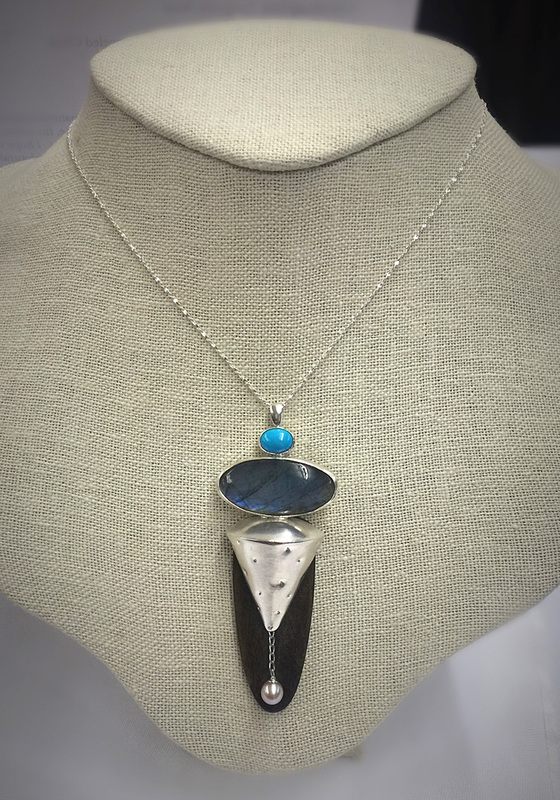 Lisa Slovis is a well-known studio jeweler that sells her work in several jewelry galleries across the country and teaches jewelry classes at Palomar College. The Maker Project was created to raise scholarship money for students that are currently enrolled in a jewelry program. While I was in graduate school at San Diego State University, I was a two-time recipient of the WJA scholarship. When this opportunity arose to participate in this fundraiser, I immediately felt this would be a wonderful opportunity to give back to an organization that had helped me tremendously during my studies at SDSU. The well-known marriage rhyme from English folklore was the primary inspiration behind The Maker Project, “Something old, something new, something borrowed, something blue.” Jewelry artists were asked to find interesting metal components (something old) that they made in their studio. They then take their handmade creations and give them (something borrowed) to another artist to make a new piece of jewelry. In addition, every participant was given a large blue bead (something blue) and a peach colored freshwater pearl (something new). Lastly, I won the drawing to receive an additional stone, a faceted blue zircon. 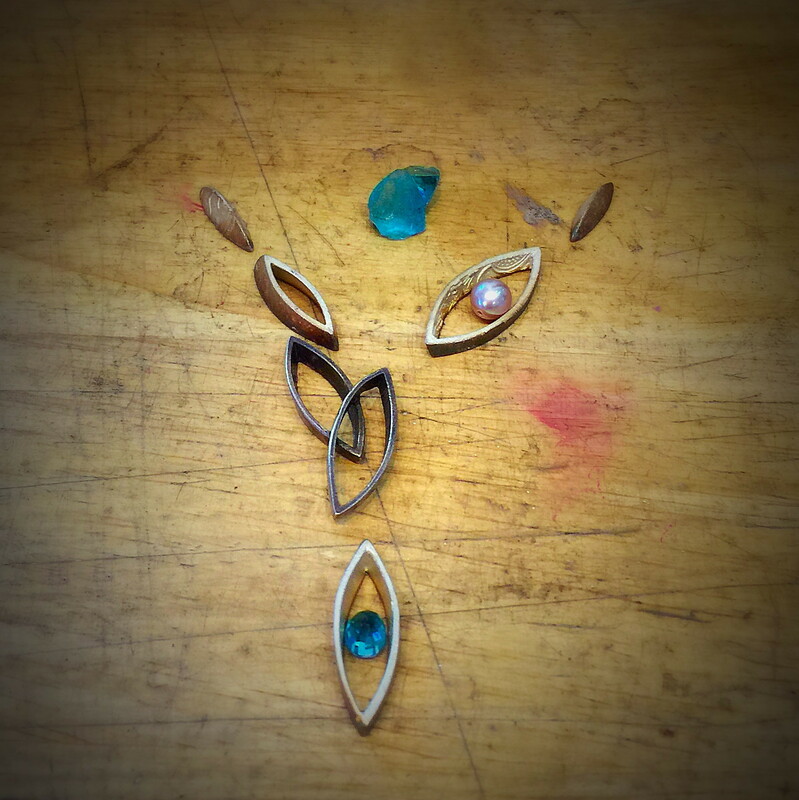 After receiving the artist pieces and various stones, I was excited to start fabricating my piece of jewelry! My selection of goodies I received to make my necklace for the Maker Project. I already crushed the blue bead and a piece of it is shown here. I thank my lucky stars that I received such stellar pieces from Michelle Loon! Michelle gave me several modern silver leaf shapes, some of which had richly patterned raised surfaces! I knew it would be effortless to make a beautiful necklace when I had such fantastic elements to work with! 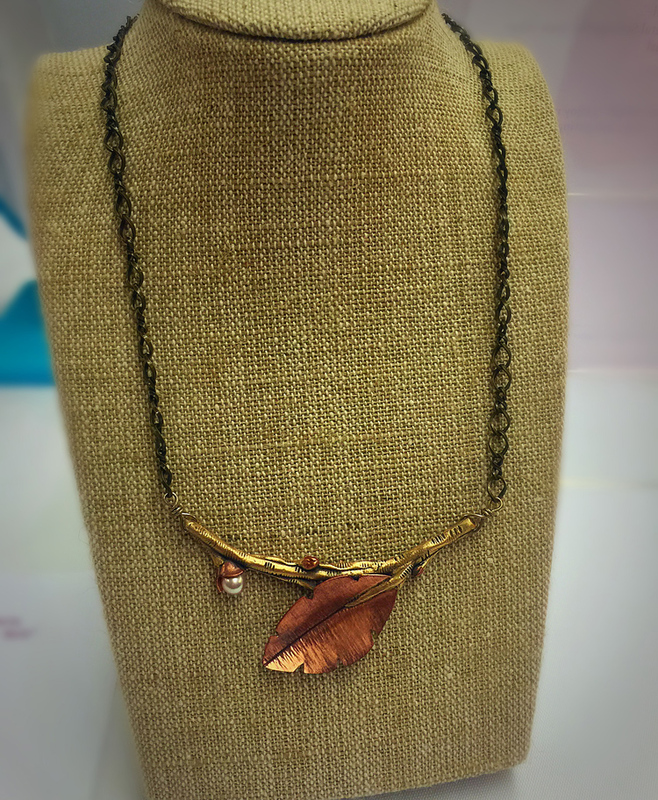 I wanted to continue with the nature theme and titled the necklace “Leaves and Rain”. I fabricated tear drop shaped silver frames. One of which I set the blue zircon and the other I placed pieces of the blue bead. Because of the large size of the glass bead, I decided to crush the bead into several small pieces so that they were more manageable in size and fit more ideally into my delicate design. I then fabricated a dangling blossom to hang in the back of the necklace and set the peach pearl inside the flower. I also fabricated my signature tag into a leaf shape. Lastly, the clasp I made also featured a leaf and branch toggle bar and ring. My finished Leaves and Rain necklace photographed by Sara Rey. 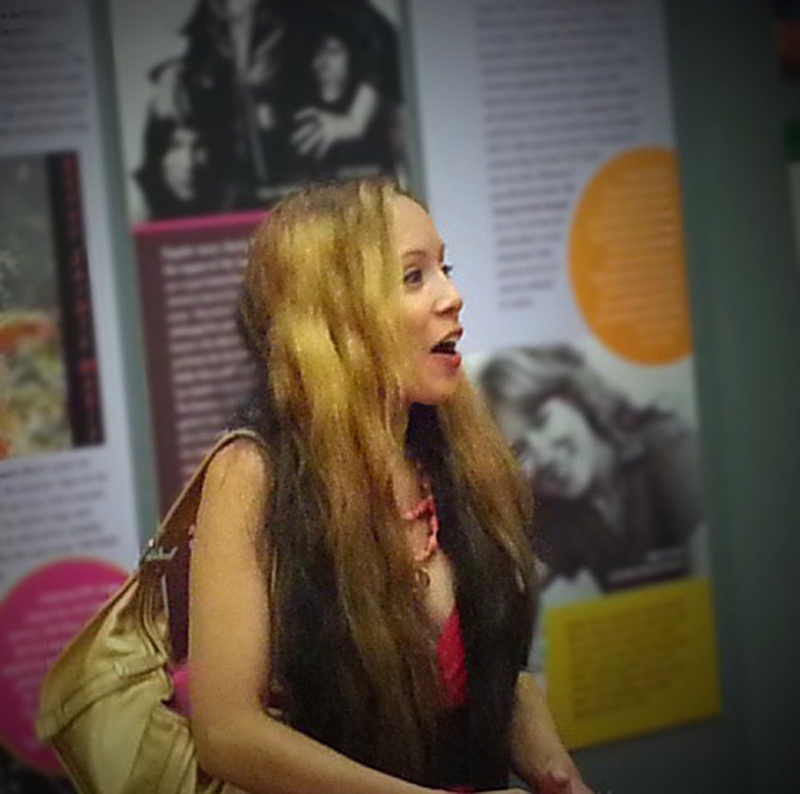 The pieces went on display at the Womens’ Museum of California in Liberty Station in San Diego. It was very exciting to finally view all the completed jewelry pieces. It was nice to see how creative the other studio jewelers were with the other artists’ components. Below are some of my favorite pieces from the event. 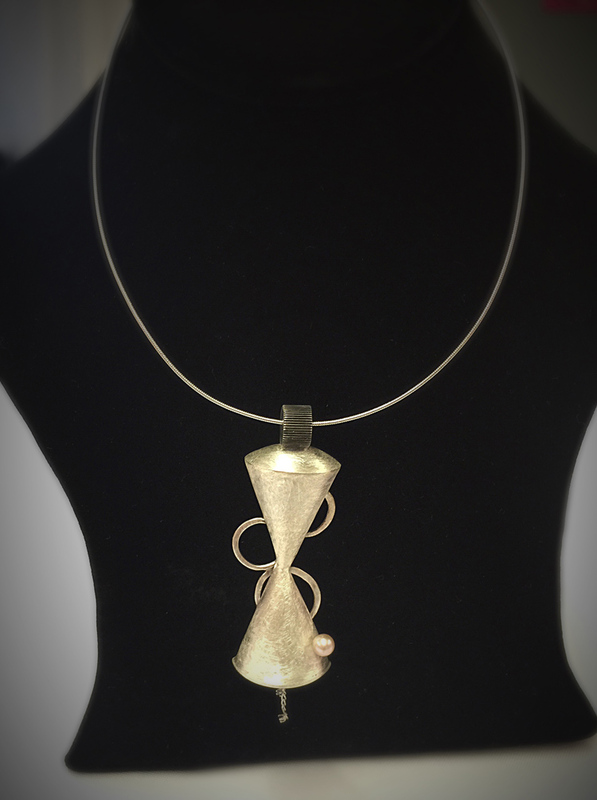 Lisa Slovis Mandel’s Necklace: Like Sands of an Hour Glass, These are the days of our lives. 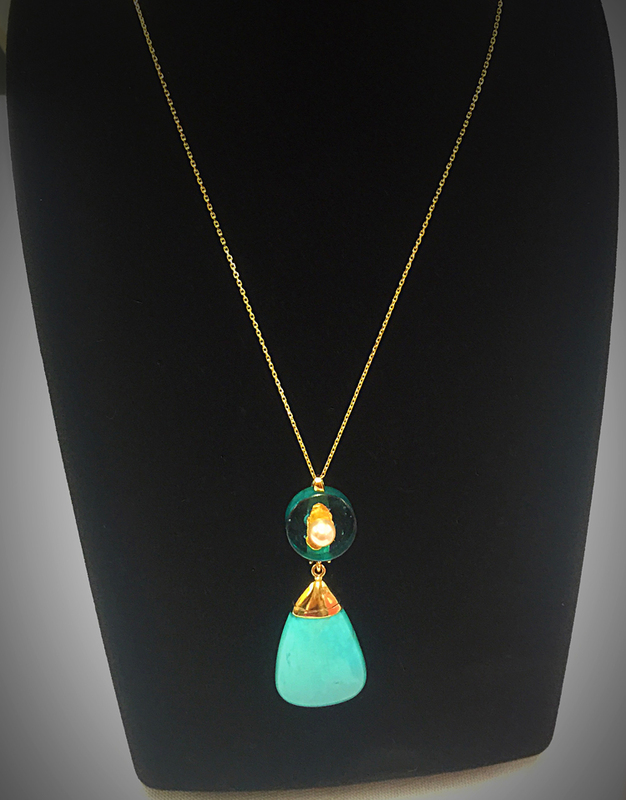 Grace Hays’ Necklace: Sometimes it is good to be blue. 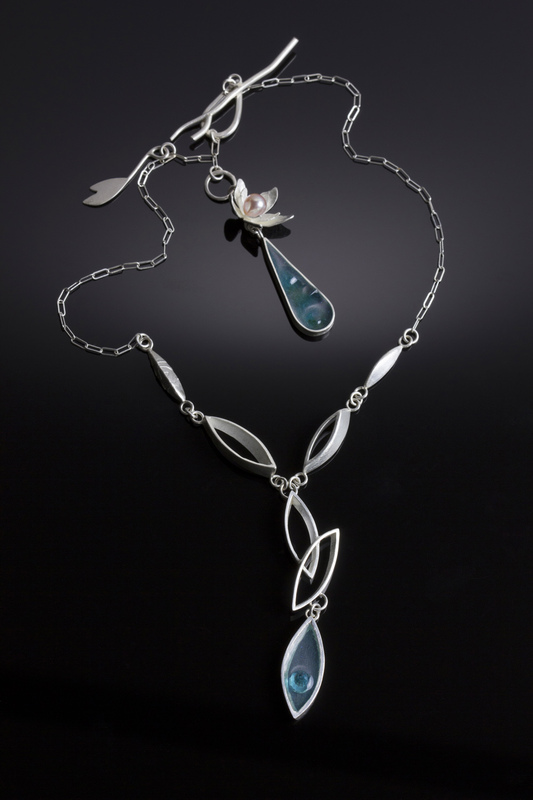 Eliana Zepeda Graham’s Necklace: Falling Petals. She is seen here modeling with her piece. 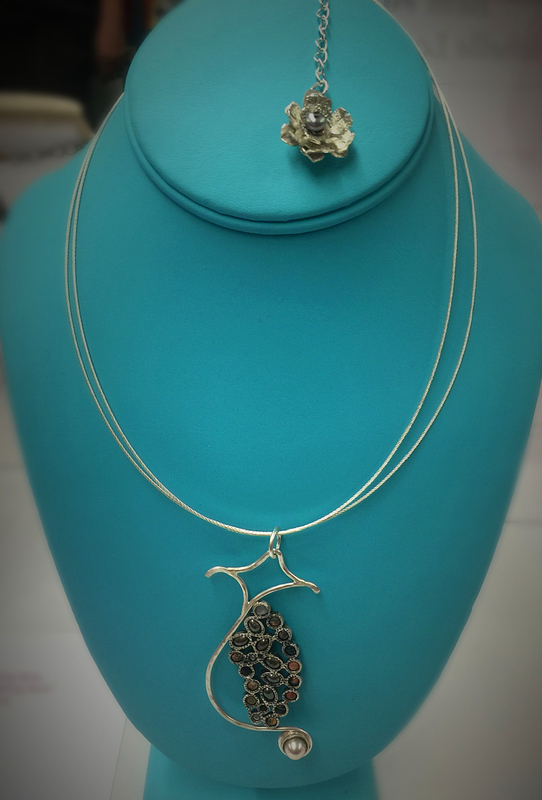 She incorporated a stylized silver chinese lantern that I made into her necklace. Betsy Kinsey’s Necklace: “a do” necklace. Her piece was chosen for “Best in show”! I was pleased that my design was chosen to be in the live auction! Lisa Slovis, did a knock out job as both an organizer and an MC! She was a lively host and promoted the work very well to generate more interest from potential buyers. The show was well planned and looked professional in its display. 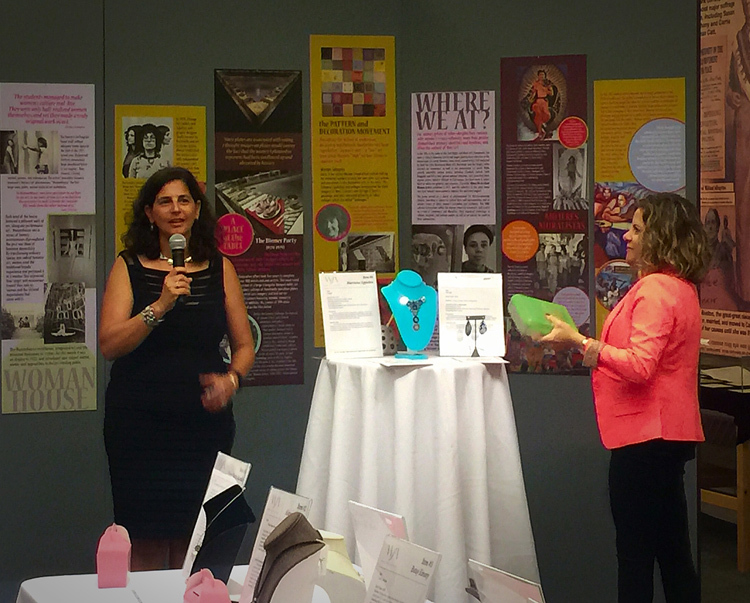 Lisa Slovis and Eliana announcing the winners of the jewelry raffle. The live auction was particularly exciting, especially because it culminated in a bidding war between two different buyers! 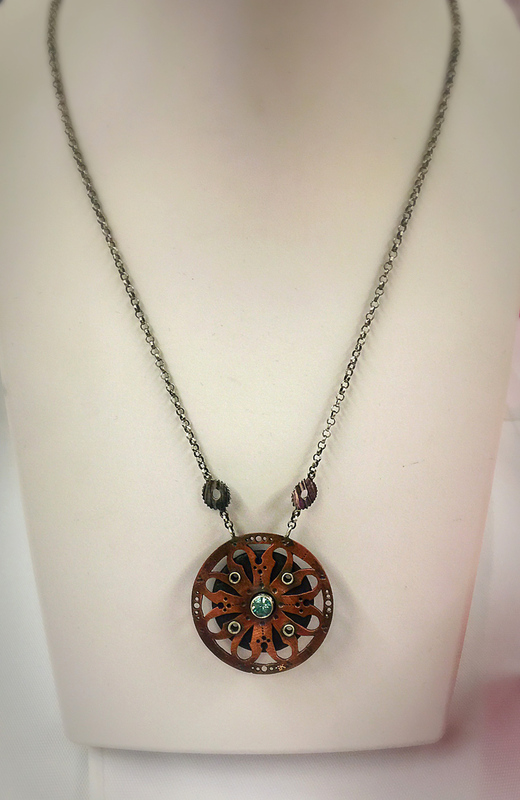 I was so pleased that my necklace raised a decent amount of money for the WJA scholarship fundraiser and sold for $800! My friends Ron and Helen took pictures of my reactions during the bidding process. 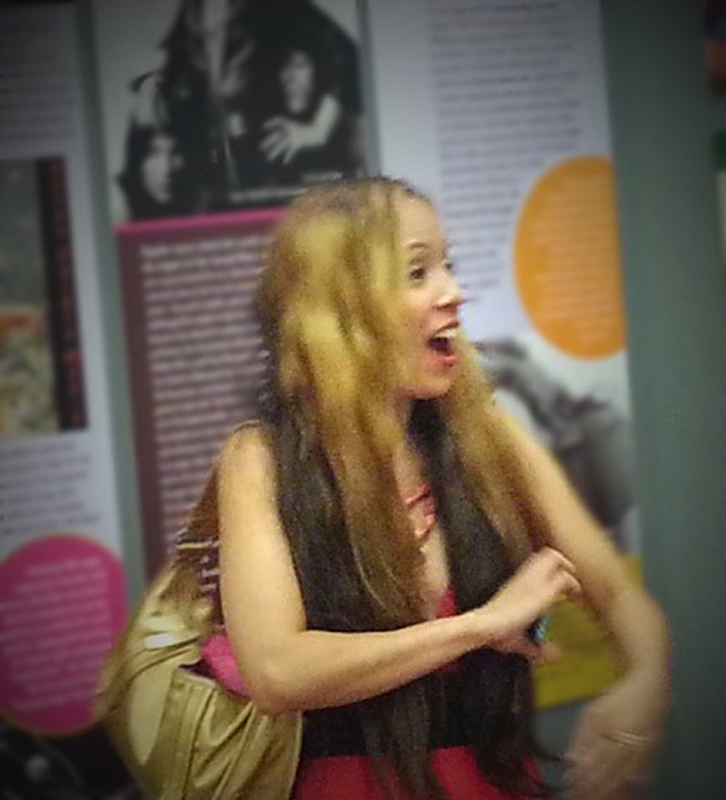 You can see that I became progressively more excited as the bidding prices kept escalating. I’m so excited here that I don’t know what the heck I was doing with my hand! All in all, The Maker Project fundraiser was a highly successful event! 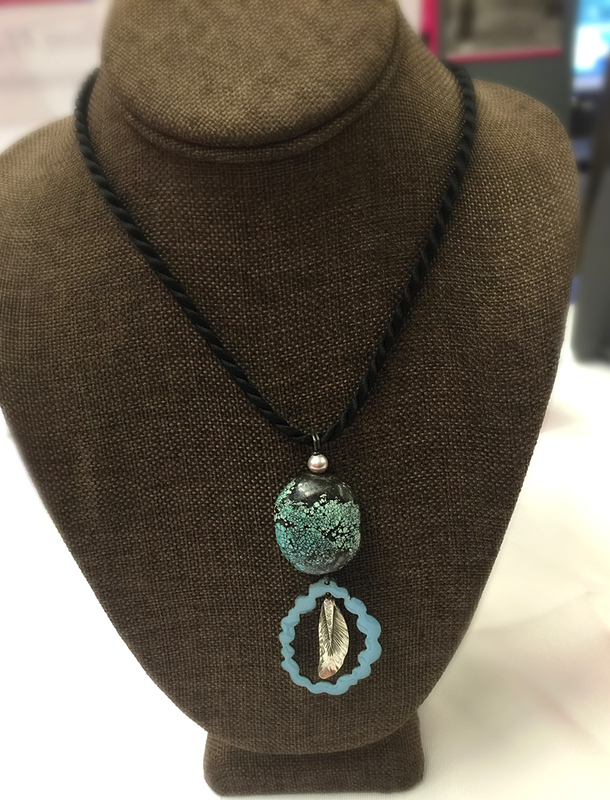 All the artist made jewelry sold well, raising thousands of dollars for the WJA scholarship! Right now is an exciting time for the organization, especially because of Lisa Slovis’ involvement. She has plans for continuing to make the organization more interactive for its members here in San Diego and I look forward to participating in future events. 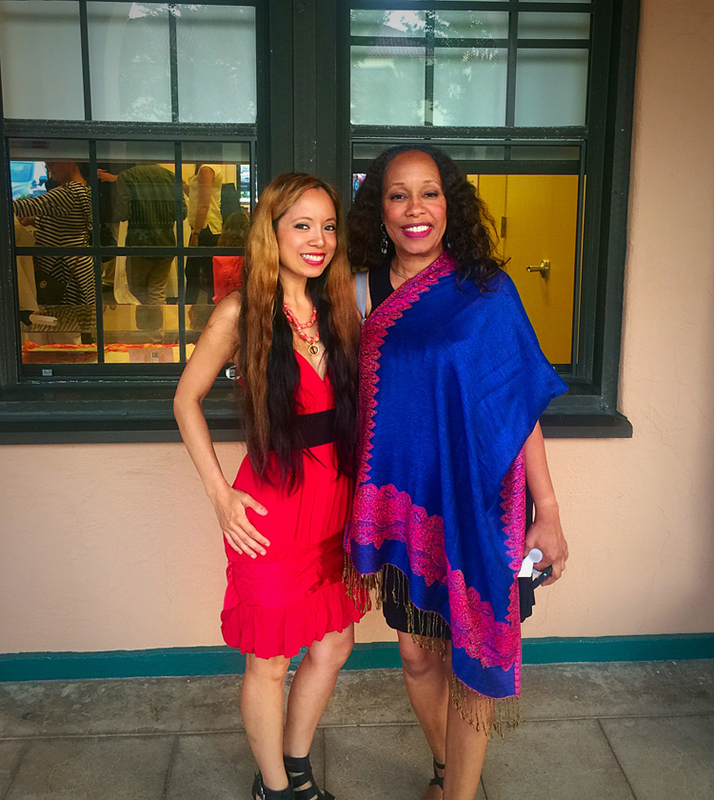 My friend, Jacqueline Gore and I at The Maker Project event.